“The Holocaust in Hungary” is an article from the virtual exhibition Holocaust Life Stories. In the 1930s, pressured by domestic radical nationalists and fascists, Hungary fell increasingly under the influence of Nazi Germany and in November 1940, Hungary officially joined the Axis alliance (Germany, Italy, and Japan). Hungary passed several racial laws modeled on Germany’s Nuremberg Laws. They reversed the equal citizenship status granted to Jews in Hungary in 1867. 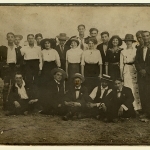 Among other provisions, the laws forbade intermarriage between Jews and non-Jews, and excluded Jews from full participation in various professions. The laws also barred employment of Jews in the civil service and restricted their opportunities in economic life. All able-bodied male Jews were required to perform forced labour. After Hungary entered the war, the forced labourers were deployed on war-related construction work, often under brutal conditions. Subjected to extreme cold, without adequate shelter, food, or medical care, at least 27,000 Hungarian Jewish forced labourers died before the German occupation of Hungary in March 1944. 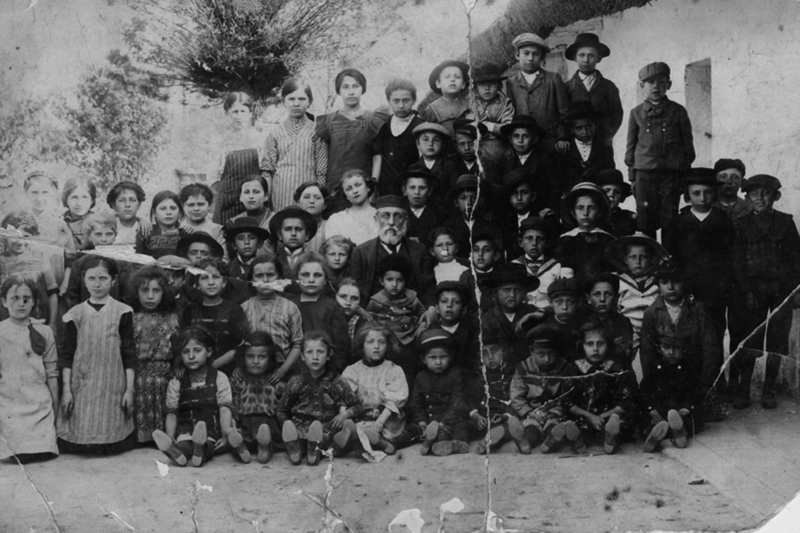 Jewish schoolchildren from Hungary, 1939. A sign posted at the entrance to the Jewish quarter in Budapest. 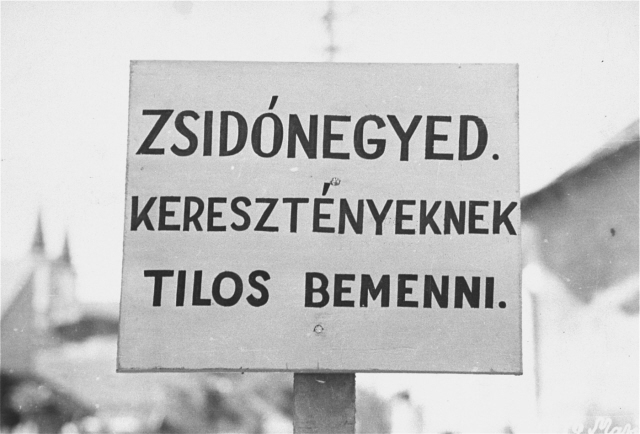 The Hungarian text reads, "Entrance forbidden to Christians." In the summer of 1941, Hungarian authorities deported some 20,000 Jews who did not have Hungarian citizenship to German-occupied Ukraine, where they were shot by Nazi Einsatzgruppen (mobile killing units) detachments. However, when, in 1942, the Nazis asked that Jews who were Hungarian citizens be delivered into German custody, Hungary refused. Ironically, most Hungarian Jews were thus spared deportation prior to the German occupation in 1944, as the Nazis did not directly control the internal activities of their allies. In 1942–1943, the Hungarian government recognized that Germany would likely lose the war. So they tried to negotiate a separate armistice for Hungary with the western Allies. To prevent these efforts, German forces occupied Hungary on March 19, 1944. Jews were packed into ghettos. In mid-May 1944, the Hungarian authorities, in coordination with the German Security Police, began to systematically deport the Hungarian Jews. In less than two months, nearly 440,000 Jews were deported from Hungary. Most were deported to Auschwitz. Thousands were also sent to the border with Austria to be used for digging fortification trenches. Of approximately 825,000 Jews living in Hungary in 1941, about 63,000 died or were killed prior to the German occupation of March 1944. Under German occupation, just over 500,000 died from mistreatment or were murdered. Soviet troops liberated Hungary in April 1945. Source: the USHMM articles “Hungary before the German occupation” and “Hungary after the German occupation”. You can discuss the Holocaust in Hungary with your students by exploring, with the help of our Teaching with Primary Sources in the History Classroom analysis sheet, the 15th letter in the 17 Letters – For the Last Time and Forever pedagogical activity. The letter was written by a Hungarian man to his brother, a refugee in Italy. You can also consult our interactive map featuring the major ghettos in Europe to learn more about the one in Budapest.